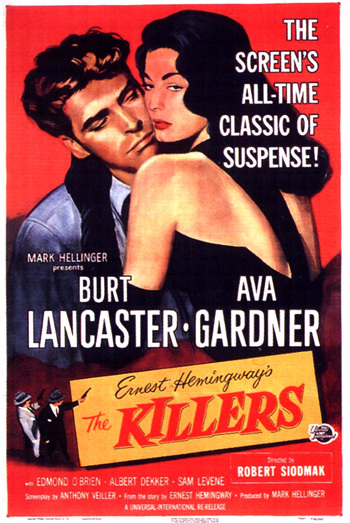 The Killers (1946), a neglected screen classic from director Robert Siodmak, is an intense, hard-edged, stylish film noir of robbery, unrequited love, brutal betrayal and double-cross. It featured two unknowns: Burt Lancaster in his film debut (at age 32) and a break-out memorable performance from 23 year old MGM contract actress Ava Gardner. Her role as the film's duplicitous, strikingly-beautiful, vixenish and unsympathetic femme fatale made Gardner an overnight love goddess and star. Former Broadway news reporter/columnist-later-independent film producer Mark Hellinger, with his first film for Universal, was known for stark, hard-boiled crime-gangster films (e.g., The Roaring Twenties (1939), High Sierra (1941), Brute Force (1947), and The Naked City (1948)). He selected a sharply-written script from screenwriters Anthony Veiller and collaborator John Huston (uncredited) that was loosely based on Ernest Hemingway's 1927 short story of the same name. This post-war, moody, expressionistically-lit black and white film was a big box-office success. It was nominated for four Academy Awards, Best Director, Best Editing (Arthur D. Hilton), Best Original Screenplay (Anthony Vieller) and Best Score (Miklos Rozsa), but came away empty-handed. It is often noted that part of Rozsa's memorable doom-laden score, with a rising and falling dum-de-dum dum - most recognizable in the restaurant shoot-out scene close to the end of the film, was later used for the Dragnet TV series. About half of the film is unfolded through eleven fragmented, disconnected and unrelated flashbacks, following a technique perfected in Citizen Kane (1941) - but they are different in form. They only reveal the story (clues and pieces of the puzzle) in disjointed fashion rather than portray varying perspectives on the main character. The narrative is composed of two strands - a journey into the dark noir world by an obsessive insurance company officer investigating an unwarranted, mysterious killing (of the Swede) and a hat factory heist, and the reconstructed story of the dead man's enigmatic and troubled past - and why he passively and quietly accepted his fateful, sacrificial death without resistance when delivered by two evil emissaries from his past. The emphasis on flashbacks underlines the influence of the past upon the present. The film was remade by the project's original director Don Siegel - but many years later in a made-for-TV film The Killers (1964). The remake starred Angie Dickinson as the deceitful femme fatale, Lee Marvin and Clu Gulagher as the hit men, and Ronald Reagan (in his last feature film role) as the gangster. And acclaimed Russian director Andrei Tarkovsky adapted the Hemingway story for his first student film in his film school days - a short 19-minute The Killers (aka Ubijtsi (1958)). The film opens with a quintessential sequence or prologue, the one faithfully borrowed from Hemingway's short story about two hit men (the 'killers' of the film's title) seeking a doomed man in a small town. The un-nerving, thirteen-minute scene is reminiscent of the opening of director Billy Wilder's noir classic Double Indemnity (1944), another tale of an insurance investigation, when the film's mortally-wounded hero meets his tragic fate. Al: What do you do here nights? Al: You're a pretty bright boy, aren't ya? When their target, a regular customer using the alias of Pete Lunn, is late and not expected to show on schedule, the gunmen leave to locate the Swede's address in the daybook at the rural filling station. The proprietor unties the two men in the kitchen, and Nick (the Swede's co-worker) runs out the back, takes a shortcut over four neighborhood fences, to get to the Swede first and warn him that he is an intended murder victim. Nick leaves stunned - in disbelief. Only a few minutes later, the fatalistic Swede calmly listens as the two cold-blooded gunman-executioners climb the stairs to his cheap apartment room. He knows that his life isn't worth living anymore. He half-rises from his bed as they open the door and brutally empty their guns of ten bullets into his body. It is the ex-boxer's final knock-out. The scene fades into black and reopens with a closeup of the personal effects of the Swede: his work uniform, Henry's Diner meal ticket, watch, deck of cards, letters, insurance policy and wallet. They are being examined in the Brentwood, New Jersey police department by the police chief (Howard Freeman) and intrigued insurance investigator James Reardon (Edmond O'Brien) of the Atlantic Casualty & Insurance Company. The chief concludes that the case is "out of our hands" because the murderers were from out of town and were specifically looking for Lunn. Curiously, the Swede's beneficiary in his life insurance policy is Mary Ellen Daugherty, at the Palms Hotel in Atlantic City. Reardon takes one of the Swede's possessions during his quest: a green silk handkerchief with a large golden harp at its center and surrounded by three-leaf clovers. He wasn't a bad sort of fella...easy enough to get along with. In the county morgue, the mortician Mr. Plunther (John Berkes) explains how the Swede died of eight bullet wounds: "Got eight slugs in him. Near tore him in half." Reardon notices that the deceased has fighter's hands - with broken knuckles. According to Nick, the Swede's phrase 'I did something wrong - once' occurred a long time ago. A few days before the murder, the Swede had become sick with stomach problems.